I guess I’ve been in a stamping mood lately. I made these sometime last week as “thanks yous” for my swap paticipants. I really like being able to use several different stamps for layering. The front of the bookmark has a house, bird, paisley and swirls and the back has the upside down queen with pigtails (that I drew in). I think Super-E and I will be collaborating on bookmarks for his class mates at the end of the school year. He can draw up the images he likes, I’ll carve them out and then let him stamp away. This weekend though, we I get to work on an Egyptian costume for a play that he’ll be in for school. Fun! 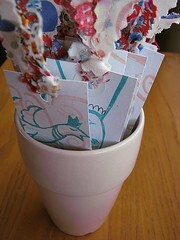 This entry was posted in i make stuff, Stamps and tagged Handmade Gifts. Bookmark the permalink. Those bookmarks are fantastic. I think I will have to have a go at making some. I really love your hand carved stamps. So much inspiration on your blog. It’s great. Regina! You continue to amaze and inspire me. Could you please make an entry about what inspires you? Your work is so sweet and comforting but not sappy or condescending. Did you have a childhood filled with fairy tales? Were your parents the long lost decendents to the Russian crown? Love it! I am new to your blog and just love the stamps you have made. 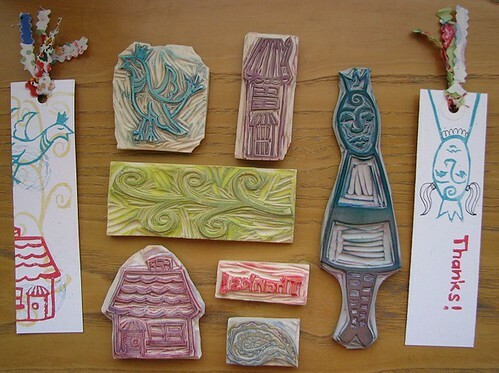 Have you ever done a tutorial on stamp making? Lovely. I especially like the tall narrow house and the pigtails were a great addition. CONGRATULATIONS! On your CRAFTmagazine blog hook-up! Good for you! I just got my package today with the cards & my bookmark. I was blown away! I can’t get over that you carve all those stamps on your own. I know it’s a lot of work. I’ll post my cards on my blog & flickr. Thanks for hosting! I’m definetely in on the next one. These bookmarks are so cute! I am completely in love with your house stamp! What a talented lady you are! What a fun, pretty project! You have inspired me! 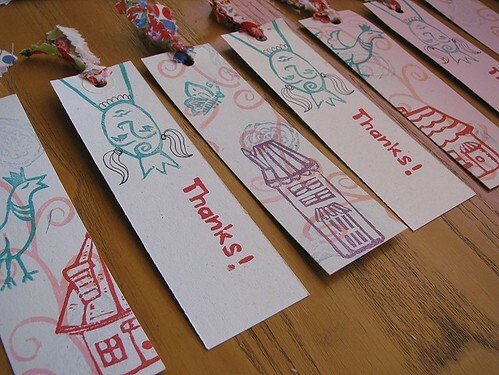 These are very inspiring bookmark designs and ideas! I love the off-center bird and house on the very left of the second pic. I like the pale and pastel colors too â€“ these might be overwhelming with darker colors, but the palette works beautifully here. Awesome ideas! very creative, and great artistic motivation and inspiration to everyone that sees it. I just found your blog – beautiful creations and photos! Have a great day! The bookmarks are really cute. I would like to have these ones. They have nice designs. 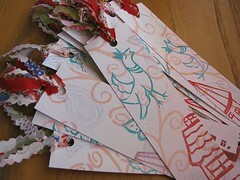 I am fond of collecting bookmarks, but I have not tried personalizing or making my own bookmarks. I am planning to try making personalized bookmarks with these deigns. I have my collection of printed bookmarks, with creative designs.